Since the start of the season, the Philadelphia Flyers have floated around the .500 mark. Despite the middling record, there have been some bright spots, namely in specific players such as Claude Giroux, Jake Voracek and Travis Konecny. Where the Flyers have struggled is in team play — in putting together a good start and dominating a team for 60 minutes. 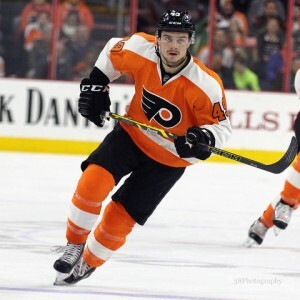 However, they may be getting some help in those regards with Michael Del Zotto, Scott Laughton and Michael Raffl all returning from injury. Del Zotto and Laughton were put on long-term injured reserve at the start of the season and can finally be removed from it today. Raffl was taken off IR yesterday and played his first game in 15 days. While that’s excellent news for the on-ice product, there are some issues that have to be fixed before everyone comes off injured reserve and healthy — both in the lineup and for the salary cap. Philadelphia has already seen how impactful getting a steady defenseman can be when Radko Gudas returned from his suspension. He leads the team in Corsi For Percentage (CF%) according to Corsica in the five games he’s played this season. The Flyers hope Del Zotto can do the same. He averaged over 23 minutes a night last season and instantly makes the team’s top four defense much stronger. However, the 26-year-old’s return does mean someone on the blue line does need to sit. Nick Schultz has already moved into the press box since Gudas’ return, so the Flyers could have two healthy defenseman waiting eagerly for their next playing time. Andrew MacDonald may find his playing time limited in the near future (Amy Irvin / The Hockey Writers). For the time being though, there won’t be any issues. Andrew MacDonald may miss about a week with a lower-body injury, who has struggled this season, much to the disappointment of Flyers fans. MacDonald has easily been the Flyers’ worst defenseman, but coach Dave Hakstol has only scratched him once and isn’t afraid to use him in the last minute of games or in overtime. He had his strongest game of the season on Wednesday against the Detroit Red Wings and his injury may come at the worst time for him. Brandon Manning is the next candidate to be the extra defenseman, but he’s been playing the best hockey of his career so far. If he continues that for the next week, it will be hard to insert MacDonald over him, even for Hakstol. At forward, Raffl replaced Dale Weise Thursday night. The former Canadien has gotten off to a slow start, but with a $2.35 million cap hit, it’s hard to imagine general manager Ron Hextall wants Weise in the press box often. Love how Jim Jackson's tone went way down we he realized it was Chris VandeVelde leading that scoring opportunity. While VandeVelde doesn’t produce much offense, he is a good penalty killer. 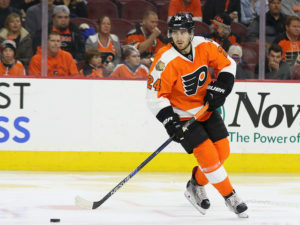 But with several other defensive wingers including rookie Roman Lyubimov, it’s easy to think that that part of VandeVelde’s game can be replaced. Laughton’s predicament has been solved for right now. The Flyers loaned him on a conditioning stint to the Philadelphia Phantoms, which can run for 14 days. After a mediocre preseason, plus the play of Cousins and Lyubimov, he’ll have to impress to get back on the Flyers’ lineup, barring any injuries. If Laughton is sent to the Phantoms when taken off IR, which can be done without waivers, the Flyers will save $863,000 on the cap. But taking Del Zotto off of it puts on $3.875 million. Philadelphia will be under the cap, but just barely. To help ease that load, a trade may be a possible route Hextall looks at. He’ll have two extra defensemen on the roster, which is part of what pushed his hand in moving Luke Schenn last year. Elliotte Friedman believes that it’s something the Flyers may consider sometime soon. The hockey insider notes Matt Read as possible trade bait, but the 30-year-old has had a minor resurgence this season. Despite a strong start, Matt Read could still be traded (Amy Irvin / The Hockey Writers). He scored five goals in five games to start the year, but has just one in seven games since and his ice time has dwindled from 18 to 13 over that stretch. Maybe the goal streak was just a hot start that Hextall could take advantage of. If that doesn’t happen, teams are always looking for depth on the blue line. Schultz makes a modest $2.25 million on his contract that expires this season. But if they want to go bigger, Mark Streit could be a trade chip. He makes almost double Schultz at $5.25 million, but can do more and is on the last year of his deal. Despite three goals in the young season, Streit has looked slow and hasn’t been a good fit with rookie Ivan Provorov. It may not be totally ideal, but shedding the salary fat may work out for Philly. The Flyers have bought some time with another injury to a defenseman, but not enough that it can be ignored. The team will have to make some tough choices over the next two weeks.